Moving Head Scanners: Rotating head scanner with a high powered multi colored wash. These are a staple in professional dj or entertainment setups. We like to place them on pedestals or on ends of setups. 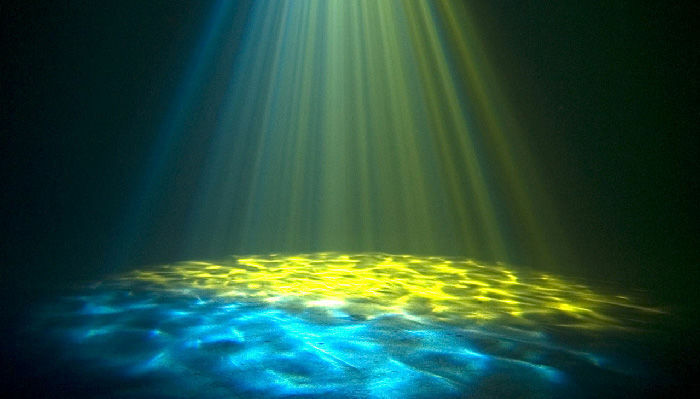 H20 Water Effects Light: This is a unique effects light that creates a watery mirage on any surface. It will cycle slowly through different colors. Looks great projecting onto the middle of the dance floor or onto a backdrop. GOBO Projector: Commonly seen at wedding projecting names or trade shows projecting company logos. We have premade gobos for general occasions or can create custom ones for your event. Professional grade lights of this type are thousands of dollars. Our unit is a great way to get a similar effect on a budget. We have red/green and red/blue laser units that will project hundreds of lasers throughout an area. They move in in rotating and star patterns. Lasers are a great bang for the buck and looks outstanding when paired with fog machines. We carry multiple solutions to create the popular black light effect. These include large UV Cannons and wide wash bars. All are LED powered and cover a good amount of area. We also have the option to set our uplights to UV mode for additional coverage. If you would like to see any demonstrations in person, visit our Pawtucket showroom Mon - Sat: 8am - 5pm.